Bull nose inserts are used in finishing when milling flats and sides. Sterling Edge's backdraft bullnose inserts are standard for profiling on draft walls requiring chip clearance during the cutting. Flat bottom inserts cut effective Z-level and plunge milling with a full 90-degree side wall and multiple standard corner radii. Sterling's sweep finishing inserts blend the advantages of a backdraft's clearance with the straight-wall cleanup of the 90 degree flat bottom. 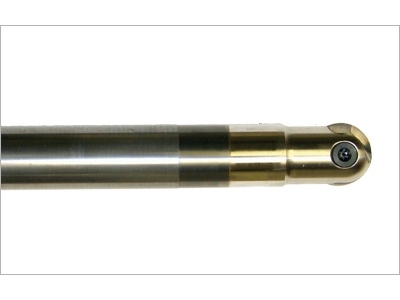 Standard milling often turns to bull nose tooling when cutting channels or slots in high metals. Other mold and die cutters, however, have discovered the process can be faster by roughing the channel or slot with a high-speed bull nose, and then finishing and shaping the cut with a bull nose or flat edge mill. Every mold and die shop can practice its own techniques to meet specific needs, but the reputation and reliability of Sterling Edge's carbide inserts and tooling is well known throughout the industry, no matter what the task or cutting challenge. Find out more about our tool bodies, inserts and solid carbide end mills at sterlingedge.net, or call us at 800-403-0808 to request a tryout of our 3D milling tools.